Tottenham manger Mauricio Pochettino is hopeful defender Jan Vertonghen will be fit for a return to action in six weeks. Belgium centre-back Vertonghen suffered ligament damage when he turned his left ankle during the second half of last Saturday's dominant 4-0 win over West Brom at White Hart Lane. Speaking after the match, Pochettino glumly forecast the 29-year-old's injury was "bad", but confirmed Vertonghen would not need an operation at his pre-match news conference ahead of this weekend's trip to Manchester City. 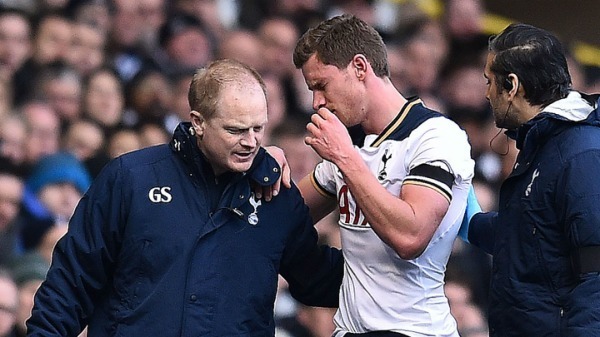 "Jan Vertonghen is okay, he's very positive," the Spurs boss said. "We're pushing him a lot. We expect six weeks, less than at first. "We don't want to set the time limit. When your mind is positive it's easier to recover. He doesn't require surgery." Pochettino was less upbeat over Erik Lamela, with the Argentina winger still out due to a hip problem he sustained in training prior to Spurs' Champions League loss to Bayer Leverkusen on November 2. "[On Friday] he will have a scan," he explained. "Still it is difficult to give the time that he can come back. We need to wait because there is still some problems and we are still not sure of the diagnosis. "Now we start to be concerned about him because he has been out for three months and still in a situation that has not moved on."